We packed up camp and got back in the boats for the return trip. On the way Brian met a mkoro poler that had been his guide on a trip here in 1997. By noon we were back at the hotel and enjoyed a delicious lunch at the hotel restaurant. 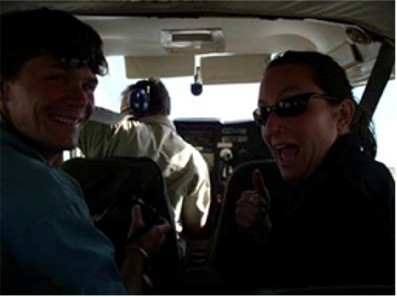 We relaxed for a couple of hours, then headed for the airport and our scenic flight over the delta. Seeing the terrain we had traveled over by land from the air was fantastic. 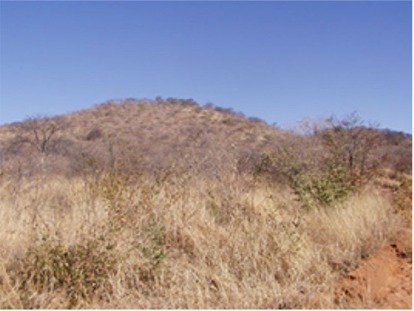 Small islands dotted with baobab trees were surrounded by blue waters and lush green grasses. The colors were spectacular. We could see the narrow channels we had navigated by mkoro, and even saw an elephant splashing through the shallow waters. There were giraffe, buffalo, impala, and lechwe, all tiny from the air. We ate dinner at the hotel restaurant and sat up talking and looking at slide shows from our trip. We spent the morning with Debbie and Brian souvenir shopping, then dropped them off at the airport early in the afternoon. Graham and Connie are heading for Drotsky’s caves tomorrow and spent the remainder of the afternoon shopping and re-supplying. That evening we met at Audi Camp for dinner. Roy and Sonya along with their three kids (Victoria, Roy, and Charity) joined us. Roy is a doctor from Wyoming who has opened a medical practice here in Botswana. They have lived here for about a year, and have spent time in Africa previously. They noticed the Colorado plates on our cars a few days ago, and wanted to get together to hear our story. They are a very interesting couple and have had some fascinating experiences here. They were kind enough to buy our dinner for us and we spent an enjoyable evening talking with them. After they left we ran into a couple who has just traversed the east coast of Africa, starting in the middle east. We traded stories for a while over beers. We have even met up with a family from Switzerland who we fondly refer to as the “Swiss family Robinson,” a family of five traveling in a large truck whom we first met in Mauritania. They are staying at Audi camp and we’ve had a good time catching up with them. We awoke at Audi camp with grand plans for the day, but things turned out slightly differently. We had breakfast with Witt and Jen. This was our last meal together and marks the breaking up of the Africa Overland team and Witt and Jen head off North to Zambia. Graham and Connie are going South to Cape Town and then shipping back to the US. After breakfast, Graham worked on the car and Connie did washing. 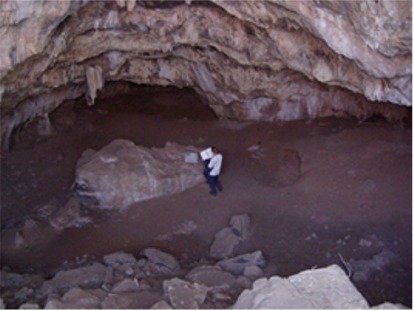 An agreement had been made to travel to Drotsky’s caves with an English couple who had driven from the UK down the East coast of Africa. Their names are Helen and Chris. At the appointed hour of noon, we all met at Riley’s Garage in Maun and hit the road for Drotsky’s Caves, one of the most remote locations in Botswana. Just before sundown we bushcamped off the track, and built a huge fire to ward off the cold. We had another productive day in town running errands and preparing for our departure tomorrow. We spent a couple of hours on the internet in the morning. We checked Expedition Overland’s website; They are in California now, and it’s interesting to read about them driving through Arizona and to the Grand Canyon in their 6x6 land rover. It must turn quite a few heads in the US! We did some grocery shopping, stocked up on beer and gin, and bought a few souvenirs for the folks back home. We picked up our newly reconditioned alternator, which given that the Land Rover dealership didn’t have a spare hub tool to sell us, virtually guarantees that a wheel bearing will fail soon. We spent the evening at Audi Camp’s bar, Jen laboriously translating an email into French to send to some of our former traveling companions. We traveled on to Drotsky’s caves after breaking camp in a relaxed fashion. The caves are completely undeveloped. The only facilities are a visitor book, and a piece of string from one entrance to the other. We arrived at about 10am and had some trouble finding the cave opening even with a waypoint. On finding the entrance we had a quick explore and decided to return after lunch. After lunch Graham, Helen and Chris took torches and went in. 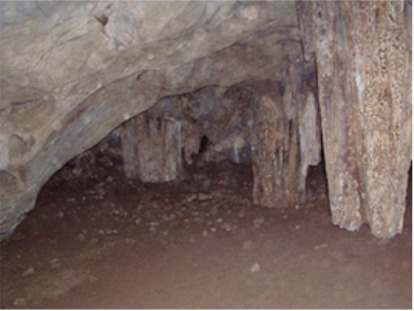 The cave complex is over a kilometer long, and requires some athletic clambering in the dark to get through. It was magnificent though. Huge stalagmites and stalactites and vast echoing caverns. After exploring the caves, we continued on down the road towards the Aha Hills. We camped off the road when the sun began to get low. After stopping at the internet café and the post office we left town this morning at about 10 am. We stopped at Etsha 6, one of several resettlement camps for refugees from Angola’s civil war located along the western edge of the Okavango delta. We visited a craft shop and a museum that housed various artifacts of unknown purpose or origin. There were no explanatory placards on the exhibits and the lady who unlocked the door and took our 20 pula admission fee didn’t know much about contents of the museum. On the plus side most of the exhibits were just sitting out in the open so you could touch them and play with them. We spent about 20 minutes there and were on our way again. Once we turned west toward the hills it was about 40 minutes on a good dirt road to the main gate. 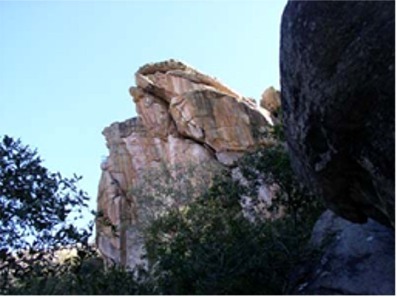 There is a very nice museum and well-marked hiking trails that take in some of the rock art that make this a world heritage site. The hills are quite beautiful, with pink and purple stone cliffs. After perusing the museum we found a suitable campsite and made dinner, enjoying the solitude of the place after a few nights of loud neighbors and car alarms at audi camp. 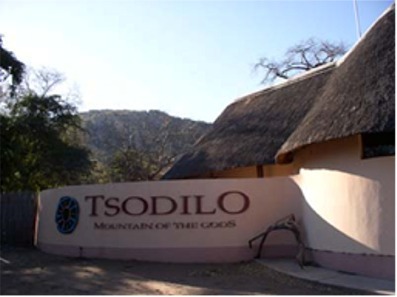 Despite the museum, admission to the hills is currently free, a welcome change from the expensive game parks. We left our bushcamp early and continued on to the Aha Hills. They aren’t really much to see, but there are two large sinkholes close to them. We stopped at the first sinkhole which is 50m deep. It is quite impressive, but smells highly of bats. We then traveled on. Nellie, Chris and Helen’s Land Rover 101FC died at one point just before lunch. After some quick diagnostics, it was determined that the fuel pump had stopped working. Chris pulled it out and repaired a broken wire and the 101 was running again. At mid-afternoon we stopped again, and found that Nellie was leaking air from a front tire. So a quick change operation ensued. We got back to the main road at about 4pm and split company with Chris and Helen. 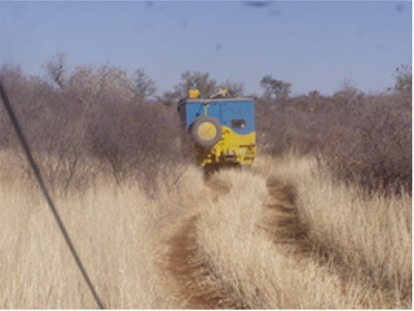 They were heading up to Tsodillo hills, while we were bound for Maun. After saying our goodbyes we hit the road and arrived back at Audi Camp at about 6pm.